And you have one of Wall Street’s most infamous scandals to thank for it. I’ve used this strategy many times myself to help identify value stocks for the Total Wealth Insider newsletter. And at the end of the month, we’re going to put that strategy to work as a stand-alone trading service run by Senior Analyst Brian Christopher. What was the scandal, you ask? The name Albert Wiggin draws a blank today. In the 1920s, he was one of the era’s most respected Wall Street bankers. Respected, that is, until the 1929 crash. The fund existed solely to quietly buy his bank’s stock — or even sell it short. 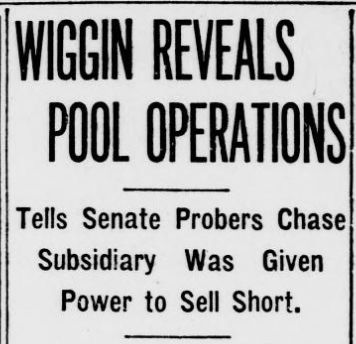 Wiggin made $50,000 in 1928 alone by making such side bets. It wasn’t illegal at the time. But it wasn’t ethical either. Regulators soon put a stop to it. But in doing so, they created a way that any investor could benefit from “insider trading” — if you know where to look. See, corporate insiders can still legally buy or sell their own company’s stock. But they have to disclose those actions to the Securities and Exchange Commission (SEC) within a few days’ time. The SEC then publishes the info on its website. That’s handy information to have in the case of, say, a beaten-down stock. Wall Street may not like the company. But what does it say about the value of the shares if executives start buying them with their own personal funds? Netflix Inc. (Nasdaq: NFLX) is a good example. In early 2012 the company was coming off a disastrous year. The shares were down 75%. Analysts thought Netflix had lost its way. Yet a pair of Netflix board members stepped up with $15 million worth of insider “open market” stock purchases. The stock doubled in nine months, and rocketed 600% in the next three years. One of the earliest academic studies on this strategy was published in 1964 by finance professor Donald L. Rogoff. Buying the same stocks as corporate insiders, he found, yielded a return of nearly 50%, compared to the market’s return of 30% for the study period. Another study, published in Barron’s in 1976 by Marty Zweig, found an annualized return of nearly 46% versus the market’s return of 15%. Still more in later decades found similar results, even when applied to blue-chip stocks in Germany or the United Kingdom. Total Wealth Insider Senior Analyst Brian Christopher recently wrapped up a months-long effort to build a trading strategy based in part on these kinds of studies. You can view our latest video together here. I’m pleased to say it’s shown equally strong results. We’ll have more information soon on how you can subscribe. Does every insider buy yield a spectacularly positive result? Of course not. But the point is, it puts the odds in your favor. And that’s all any investor can ask for.